Unfortunately, it won't hit that mark until 2020. The short-term outlook for oil remains murky, with calls ranging for oil to be anywhere between $20 and $70 a barrel before year-end. However, longer term the picture for crude is starting to come into clearer focus as two very distinct trends emerge: Demand is rising while supplies are falling. This has OPEC starting to turn decidedly more bullish on the oil market as it sees crude prices touching $80 a barrel by 2020. The plunge in the price of crude is having a major impact on the oil industry, with U.S. producers really taking it on the chin. The price drop cut deeply into oil cash flows forcing the entire industry to pull back the reins on spending, leading to a screeching halt to U.S. oil production growth this year. That ended the dramatic upward trajectory of crude production in the U.S. US Crude Oil Field Production data by YCharts. With prices remaining low, the declines that started earlier this year are only expected to continue as we head into 2016. In fact, U.S. oil production is now predicted to slide by 400,000 barrels per day next year, which is the biggest drop since 1989. That decline is expected to be a key part of putting the crude oil market back into balance. 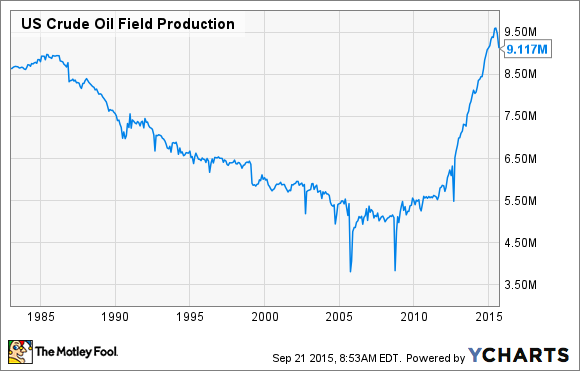 As production is declining, demand for oil is starting to accelerate. According to the International Energy Agency, demand for oil is growing at the fastest pace in five years as low oil prices spur demand for more crude. The IEA sees demand for oil rising by 1.6 million barrels a day this year, which is 200,000 barrels a day higher than its earlier forecast and more than double last year's demand growth of 700,000 barrels a day. Meanwhile, it sees demand rising by another 1.4 million barrels next year. That's 3 million barrels a day of incremental demand for an oil market that at its peak was oversupplied by around 2 million barrels a day. Given the outlook for falling production in the U.S. over the next year, there's reason to believe that crude prices could rebound. Having said that, OPEC doesn't see a swift return to triple-digit oil. Instead, it forecasts a measured return to an $80-a-barrel level by 2020 -- it projects crude prices to rise by $5 a barrel per year. That outlook, however, implies that crude would be in the $55-per-barrel range this year, not in its current $45-per-barrel range. That leaves room for some optimism as crude would appear to have more upside than downside. That outlook meshes well with what others in the industry are suggesting as Core Labs and EOG Resources, for example, both see a recovery on the near horizon. Core Labs believes U.S. oil production is poised to fall by a half-million barrels per day by year-end and that next year we'll see year-over-year production declines in the U.S. and Canada coupled with stagnate oil production in most other international markets outside of OPEC. This, according to the company, "may lead to a sharp recovery in crude oil prices and industry activity levels." Meanwhile, EOG Resources sees that same outlook of production declines in the U.S. and in other non-OPEC nations, which when combined with reasonable demand growth, "gives a decent opportunity for prices to be a bit better than they are right now in 2016." OPEC seems very content to let the oil market fix itself. That appears to be what's happening as oil production is noticeably declining in the U.S., with more slumps on the horizon both in the U.S. and around the world. Furthermore, oil demand is accelerating as the cure for weak demand is lower oil prices. It's why OPEC doesn't feel compelled to act as it believes the oil market is healing itself and that crude prices will be meaningfully higher by the dawn of the next decade.